Day Six. I felt pretty good so I started working from home. I was still hooked up to my ice machine most of the day, but I was able to sit up in my bed and type away on my computer machine. I played a lot of card games with Tate. For some reason, he won every time. Day Seven. I had my first physical therapy appointment at 7:50 a.m. After being able to sleep in for a week, this was brutal. The therapy girl moved my leg around a bit. It was bending in all the ways it was supposed to (I'd been doing my little leg exercises at home like a good boy). She then showed me how to do some new exercises, which were a bit more challenging, and had me ride on the exercise bike for eight minutes. While that doesn't seem like much, it was pretty tiring. While my hip was feeling fine, this was the day I kind of lost it. Lying in bed and watching Friday Night Lights all day sounds pretty great, by day seven I was so stir crazy I could hardly stand it. Just to get out of the house, Traci took me over to her parents' house while Tate played with his cousin. Being around actual people (are Jason Street and Tim Riggins actual people? I just didn't know anymore) was a huge help. I also drove a car for the first time post-surgery. I was surprised when the doctor told me I basically had no driving restrictions, as long as I wasn't on the pain pills. I even got a handicapped parking pass, which Paige and I both realized was pretty sweet when we got a front-row spot for her dance lessons. Day Eight. I felt pretty good in the day. I would have been happy to ditch my crutches but I'm supposed to keep using them for at least another week. My required ice machine usage was downgraded from 22 hours a day to just a few hours a day, which made me almost feel like a free man. Traci went back to work for the first time and I assured her that I would be fine with the kids. Yeah, maybe I wasn't so fine. Going downstairs to play the Wii with Tate, and then back upstairs when he needed to put on his Hulk Hogan costume, and then back downstairs when he was all dressed was a little much. I couldn't wait to get hooked back up to the ice machine. And those pain pills I'd been avoiding, yeah, I needed some of those. Day Nine. My plan is to go back to work on Monday, but my department was having a big offsite meeting today so I figured I better go in. I successfully drove to work (but all the handicapped spots were filled - bummer) and sat through two hours of the meeting. I feel okay when I'm standing and I feel pretty good when I'm lying down. Sitting is the toughest. 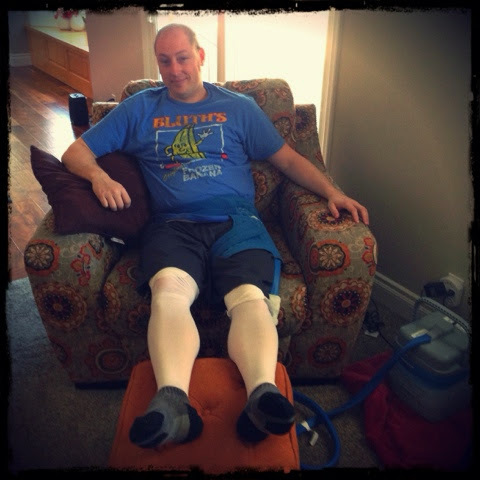 It felt great to get back home and spend time with my beloved ice machine. Tonight I spent the evening working on Paige's math homework. She's tackling double-digit multiplication for the first time and, man, it's tough. Helping her get through her worksheet was the most exhausting thing I've done all week.